Shock-absorbing for sensitive feet. These innovative insoles have been specially designed for people with diabetes, arthritis or other conditions that result in sensitive feet. The dual layer design has resilient, shock-absorbing properties giving you advanced underfoot comfort. The soft material gently cradles the foot and allows enhanced redistribution of body weight for increased comfort. Guaranteed to keep feet cool, dry and odourless. Ideal if you have vulnerable or sensitive feet. Shock-absorbing for increased underfoot comfort. 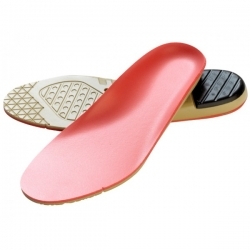 I have a damaged joint in my foot and these soles help enormously to relieve stress to the foot. They make comfortable walking possible.